Our mission is to become your irreplaceable vendor of choice by elevating your property values and improving your property’s reputation by delivering superior service, with expertise that will protect your investment, and reduce your liability exposure. The innovations, leadership roles and trends we have created in helping to raise the standards of professionalism in our own company have ultimately helped to set new standards for the exterior building maintenance industry. To provide the highest degree of safety, quality and professional glass, metal and specialty cleaning, access and consulting services to all our clients. To attract, motivate and retain the best employees. To provide an uncompromising commitment to safety, quality and customer service. To pursue excellence, technological advancements innovation, and continuous improvement. Customer satisfaction at the heart of everything we do. Partnering with our clients, we are dedicated to competitive pricing, Green Technology, and the long term interests of the Building. Safety should never be taken for granted; it is invaluable in terms of liability protection for the Property Owner or Manager. Value is not just competitive pricing, it includes safety, quality of workmanship, problem solving and project completion. We deliver results, not excuses. Service One is committed to providing the highest quality cleaning and restoration with environmentally responsible products, with the goal of reducing the environmental impacts of our business operations. Our goal is to provide 100% LEED compliance by using only Green Seal Certified Glass Cleaners and inert polishing compounds for glass restoration. After 34 years of experience in the window cleaning industry, we have had the opportunity to use thousands of different building access and fall protection systems. Service One has helped design, specify and use numerous suspended access systems on buildings ranging from 75 feet to over 1100 feet in height. We also provide site specific engineering to safely rig or provide access to atriums and facades that have no permanently installed suspension anchors or davit systems in place. Our alliance with Pro-bel provides practical, permanent solutions for your access needs. Combining our expertise with Pro-bel’s design, engineering, and equipment manufacturing innovation allows us to produce a system with the ultimate features in safety and functionality. Service One is a factory-authorized inspector of Pro-bel installations and equipment. Call us for a free consulting and hazard assessment. Working with you for over 34 years! Service One Inc. has set the standard for over 34 years with safe, highly trained expert Union technicians and an investment in unique access equipment. Founded in 1984 by Tom Trinen, our commitment to the long term shows in the pride our clients, employees and the public takes in the buildings we maintain. Our mission is to partner with our clients to increase the value of their properties with our service and the experience our team brings to the relationship. 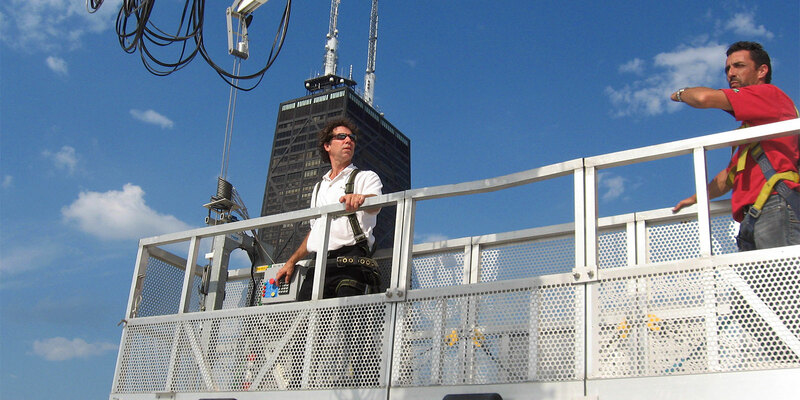 Tom Trinen served as President of the International Window Cleaning Association (IWCA) in 2000, and served on the Board of Directors for over 7 years. He is a Charter member of the IWCA, and the first Chairman of the International Window Cleaning Certification Institute (IWCCI). He worked tirelessly with the SEIU to develop an Apprenticeship and Training program. He is Vice Chair on the ANSI I 14 Committee for Window Cleaning Safety, the recognized safety standard in the United States since it’s accreditation in 2000. Mr. Trinen’s commitment to the technical aspects of architectural glass maintenance is evidenced by his involvement and contributions to the ASTM Subcommittee on Architectural Glass. We are proud of our various projects and achievements over the years. Personal attention to every account is our trademark, with our management team supervising every project, large or small. With the financial and bonding capabilities and an operations team that can tackle any size project, our clients understand that our experience and track record is a valuable resource they can rely on. With a proven track record servicing hundreds of buildings year after year, we pride ourselves on our honesty and integrity. We DO NOT hire independent contractors. Our employees are professionals with years of field expertise, fully covered with workmen’s compensation coverage and bonded. As a quality contractor committed to the long term, we are well insured against all contingencies and eventualities; our insurance coverage is more than adequate. Service One carries statutory workmen’s compensation, $2 million General Liability coverage and $10 million umbrella coverage. Bonding capabilities to $1million. We value our employees and recognize that the employees come first, as it is only with great employees, our management systems, and incentive programs designed to attract and retain the best employees, that help make our company a success. We would like to hear from you. Relocation benefits are possible, depending upon experience and current positions available. We always have positions available for skilled or apprentice technicians, window cleaners, and mechanics with the right attitude and a desire to be the best.